It is all zeros and ones inside of the machine! This simple code creates an array of integers, and displays them. Without knowing anything else, we know that at runtime, this creates a chunk of space in the system’s memory where this array is stored. Those integer values are stored in those locations until we fetch them for output. Looks good (if somewhat boring), but we have a start. What if you really want to know where this data lives in your memory. Can we figure that out? Sure, we are programmers, we can figure things out. C++ provides a neat operator: &, which will tell you the address of something. You should look up the iomanip library, it provides a lot of handy tools for making you output look nicer. You see the addresses of each data item here. The notation is called hexadecimal, something we will get soon. That big pile of funny characters is the actual address in your machine where this data item was stored. (Well, actually, that is a tiny bit of a lie!, But we will assume is is the real address for now!) The actual number on your machine might be different. Addresses in the modern Pentium are actually 64-bit things, and those hexadecimal strings are not quite right, but they give us an idea where the data is located. If only we can figure out this hexadecimal stuff! Let’s get rid of weird notation, and see the real zeros and ones! To do this in C++, we need some help from another tool available in the C++ Standard Template Library. Phew! That funny line (8) is doing nothing but converting our data item (data[i] into a 16-bit binary thing that we can send to the cout method. The conversion creates a new data item named bin with interesting properties we will look at later. For now, this lets us see exactly what the data container is storing, this time looking at all the zeros and ones! I am going to omit the compile step in the future examples, they are all exactly the same. Now we see the binary representation of our short C++ data values. Now, I can see all those zeros and ones! Neat! You know how to count, right? All you do is add one to each number. How do you count in a floating point world? That does not make sense. Counting has to do with whole objects, not parts of whole objects. Integers are about whole things! So add one to count. (Wait, what about subtracting? We will deal with that in due time! Counting in binary is pretty easy. The pattern you see here is worth a closer look. All of those numbers are powers of 10. We have ten symbols, which we call digits, available in our decimal system. In binary we restrict the number of symbols to two, and we choose to use zero and one, not for any special reason, other than we are most comfortable with those. In fact, the symbols themselves are not important. It is how we use them that is important. If I give you a symbol, and ask what comes before that one, or after that one, you know the answer. Well, maybe you need to know a bit more, but you get the idea. What happens when we run out of bits to store something in? Well, we are stuck. A fixed size container can only hold a fixed number of bits. Keep counting in a 16-bit container, and you run out at 65535. Why? Add up all those powers of two and you get 65535. We can represent a total of distinct whole numbers in 16 bits! (0-65535). If you need a bigger number, you need more bits! Look at the series of binary numbers above. The “ones column”, which in binary is two raised to the zero power, alternates every count. We run out of symbols quickly in binary, and “carry” a one into the next column. The “twos column” (two raised to the first power) alternates every two counts. The “fours column” (two raised to the second power) alternates every four counts. And so on. Each “column” is another power of our base, two in this case. Once you have that pattern down, counting in binary is easy! Now, writing down a 64-bit number is going to take a lot of zeros and ones (duh!). Being lazy, programmers came up with a shorter way to represent them. Now, that 64 bit number is down to 16 characters. What happens if we count backward, subtracting one each time? That is not so bad, except for one thing. How do we “borrow” from the next column? As long as there is a one there, we can do that. Actually, you borrow the same way you did when you learned subtraction in your early days! But, go back and look at the binary representation of minus five! That one looked very strange! We humans are kind of picky. If we add minus five to positive five, we want the result to be zero! No exceptions! How are we going to represent a negative number, using only bits? One idea is to steal one of the bits and make it represent the sign of the number. There is a problem with this! Try adding them together. Remember, this is binary, so when you get a two. you write down a zero, and “carry” a one into the next column. If you get a three, write down a one, and carry a one into the next colun. You know how this works! Boy, that does not look anything like zero. Look closely, there is a 17th bit showing there. It is a one! But, since the result must be squashed into a 16-bit container, we just put the lower 16 bit in, and toss that extra bit. Hey, we end up with zero! As odd as this seems, this is exactly how we store negative whole numbers in the computer. In Twos Complement form! Obviously, with more bits, the machine can store bigger numbers! Now that we have a handle on integer numbers, let’s look at how we store a number with a decimal point. The idea starts off with a simple thought. What happens when we use that decimal point thingy? Hey, those numbers are the same! (1 * 1) + (0 * 0.5) + (1 * 0.25) = 1.25! We could stay with this idea and do fairly well with simple floating-point numbers, but we run into problems quickly. Some folks, like engineers and physicists want to use numbers with an insane number of digits before or after that decimal point. Like 0.00000000000123! Real, human, floating point numbers are struggling to represent something that has an infinity of values. Unlike our simple integers, there are an infinite number of values between any two other values. That gets messy very fast. We need a way to represent these numbers well enough to be able to use them. Those pure math types will just have to learn to deal with that if they want to use our computers! The E means “exponent”. The number after the E is a number, which can be negative). That number tells you how to slide the decimal point into the right position. E14 says slide it 14 columns to the right , E-14) would say slide it 14 columns to the left! This is called “Scientific Notation”. When we deal with floating-point, we accept the fact that the right-most digits are not so important, compared to the left-most digits. If we have a big number, and we lost that right-most digit, we still have a pretty big number, close to the original number, but off by some tiny amount. In engineering and science, we accept the fact that some calculations are not going to be exact. Still, we want them to be as close to exact as we can make them. Take a fixed size container, say 32-bits big. Cut it into two basic parts, one 24-bits big, and the other 8-bits big. We will encode the “significant digits”, the ones we are keeping in our “Scientific Notation” - after truncating, in the 24-bit part. Since that leftmost bit should always be a one (to be considered significant), we will not store that bit. Instead, we will assume there is another bit in the number, and it is a one. Hey, every little bit helps! The “exponent” is a whole number, so they simply took those eight bits and encoded it as an 8-but twos complement number. That give us the ability to move the decimal about 128 columns left or right. Should be fine for calculating the interest on your bank balance. But what if 32-bits is not be enough. The answer is simple, use more bits! We will not go there, this is enough for an introduction. Look at this encoding, it has nice properties. All of the digits are in order. Whatever the code is for a five, add one to that code and you have the code for a six. The code for a “B” is one more than the code for a “A”. Add 32 to the code for “A”, and you get the code for “a”. We can use that to capitalize something, or sort things according to the order of characters in our alphabet. Actually, the codes below the code for a space character, are called “control codes”. They are not “printable”. They were used to control printing devices in the “old days”. Today, the only ones we tend to deal with are “CR” (carriage return) and “LF” (line feed). Most of you do not even know where those terms came from! 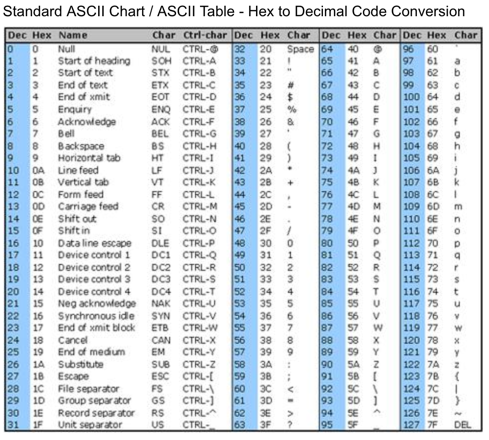 ASCII is a set of 128 symbols. That takes seven bits to store. Since seven is an UGLY number, we use 8! That means each character takes one byte. We could do something with that extra bit. In fact, IBM did just that, creating a bunch of symbols we could use to build forms on the screen. Remember, they wanted to sell machines to accountants! They managed to fill up all 256 slots available in a chunk of memory, each chunk addressed using an 8-bit binary number. We will not explore this here, but you should be aware that there is a push to stop using ASCII in our programs, and switch to Unicode. How many characters are there in the Chinese “alphabet”? I put that word in quotes, because in Chinese, the symbols may represent an entire sentence in English. A book I bought in Shanghai told me I had to learn 4000 symbols to read a Chinese newspaper. (I never finished that book). 4000 is too big to fit in 8-bits. But it will fit in 16-bits. Unicode was invented to deal with all human languages, even Chinese! There are codes (and graphical symbols) available for most of the languages we are aware of, even Klingon! I will let you explore that on your own. Your real challenge is to come up with code that makes those encoded gadgets work the way you want! How Big are ACSII Codes?